I had already decided that I would not extend my stay in Dalhousie. The town is designed to accommodate honeymooning couples and families on a leisure trip (and the parents of DPS students and the army guys). I wanted to get to Dharamshala. 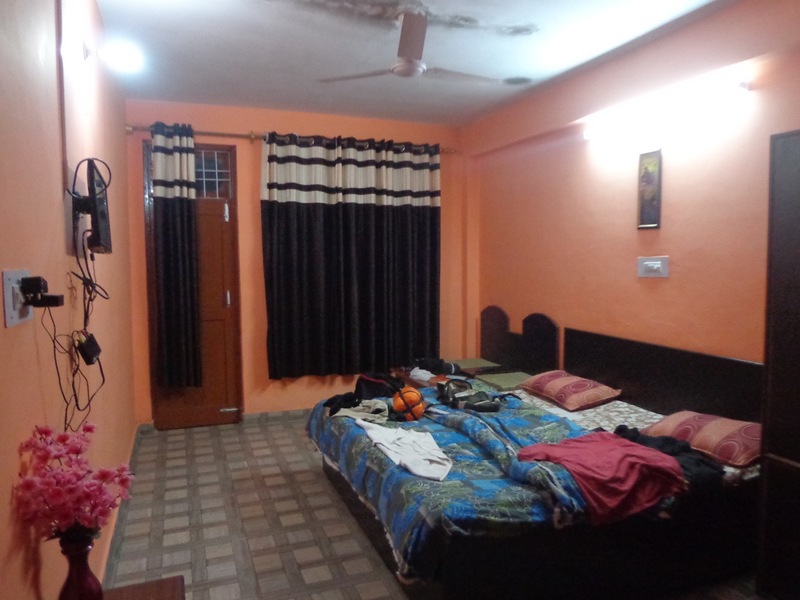 So, I booked a hotel room online and asked Sanjay of Megha View regarding how to get there. There are two direct buses. 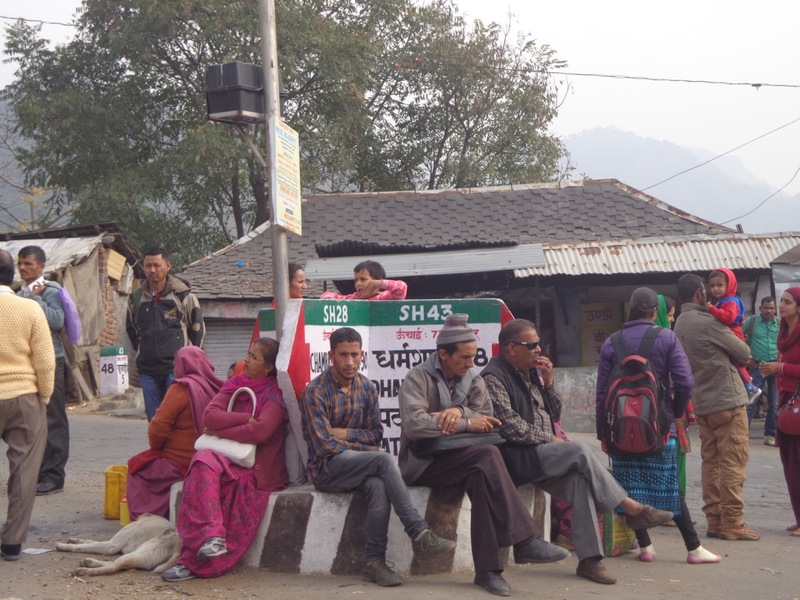 The first bus to Dharamshala leaves at 7:00 am. Since my hotel was 4.5 kms away from the bus stand, it would have been an arduous task to catch that bus. The second bus was at 11:45 am. I decided to target that and not hurry. Fortunately, I did not have to walk the entire stretch. I caught a bus coming from Khajjiar and got to Dalhousie bus stop in fifteen minutes. I also had my breakfast there. The owner of a shop called Popular Stores proclaimed that sandwiches are their speciality. 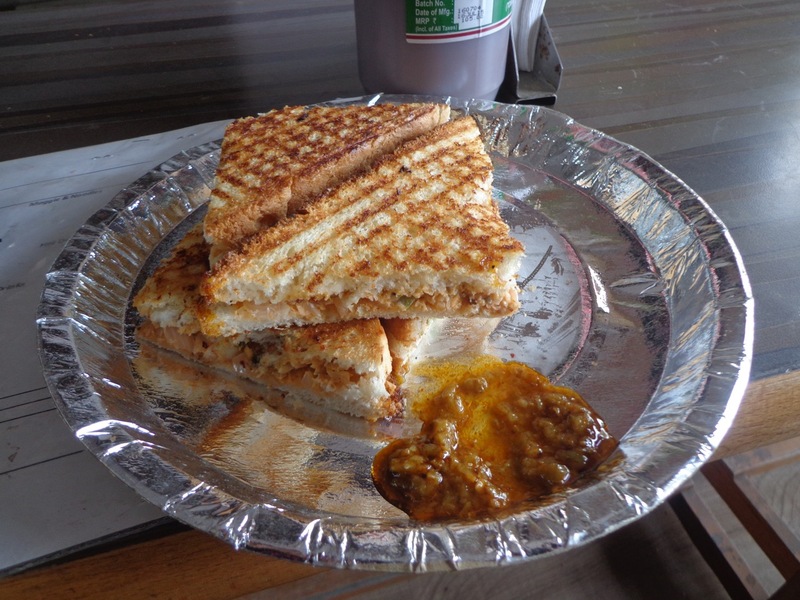 The sandwiches were nice and the outer crust was crispy. The dip, known as Chamba Chukh, was so tasty that I asked for seconds. It is made by pickling crushed green chilli in lemon juice. The bus started on time. At around 2:00 pm, it stopped at a junction called Lahru. I had a modest vegetarian meal comprising of two rotis, cauliflower fry, dal and kadhi. After my meal, I clicked a few pictures of the place. 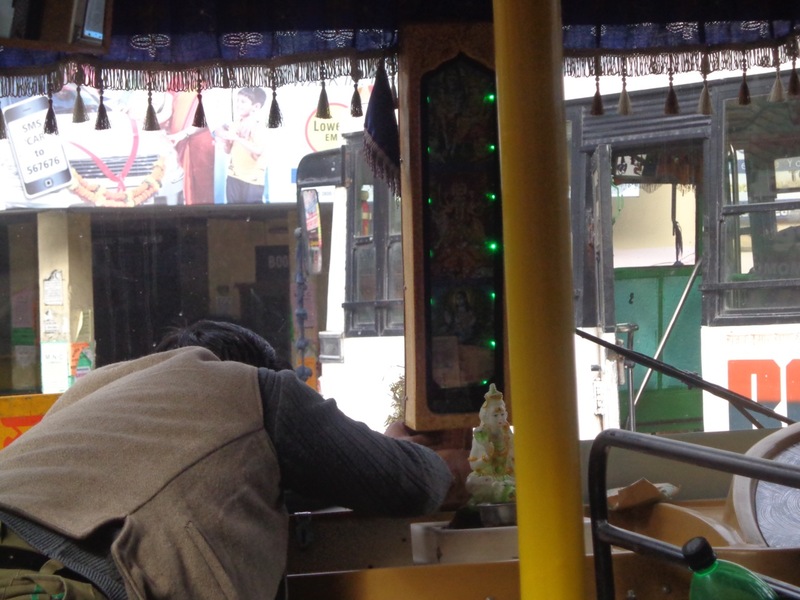 Before starting the journey, the driver offers, or rather shoves into a slit, a twenty rupees note to the deity. Lahru junction. The marker pole at the centre doubles up as waiting spots for travellers. Lahru has only a handful of shops. The foggy mountains make a picturesque background. Things started getting worse from here. The buses in the hills stop even if one person waves his hand. In fact, that’s how I got on the bus towards Dalhousie bus stop in the morning. Probably, today was one of those auspicious days for marriage. I saw many decorated tents erected for marriage on my way. A lot of people, after attending these marriages, hopped on to the bus. This not only made the bus crowded, but delayed it considerably. 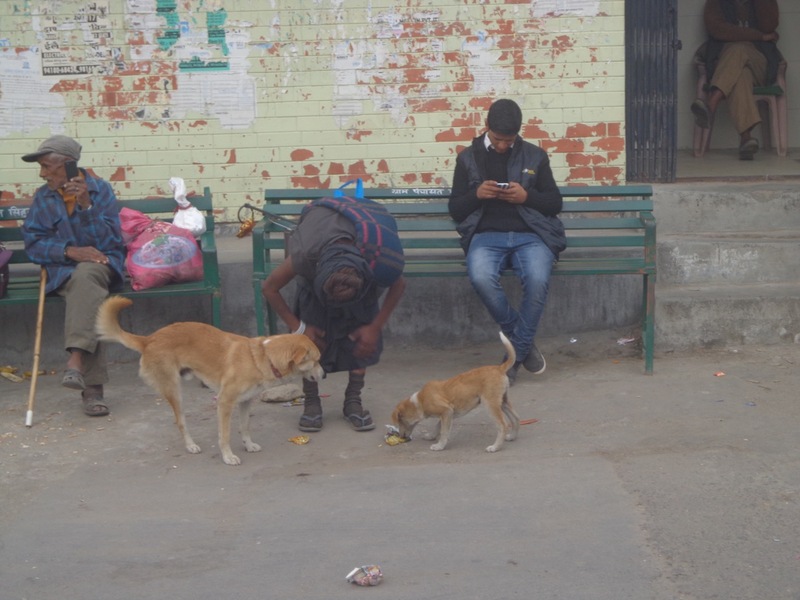 An ascetic feeding two dogs. I took this photo when the bus had stopped to let a large number of marriage attendees in. When the bus hit NH 20 at Dramman, the conductor said that the bus would not go till Dharamshala. He promised to make suitable arrangements for me. Apparently, I was the only one who had intended to travel the entire 125 km stretch and I still had 25 kms to cover. He put me on a bus that was headed to Kangra. This second bus conductor dropped me at Gaggal, showed me a parked bus and said that the bus would take me to Dharamshala. He also gave me seventeen rupees for my next ticket. 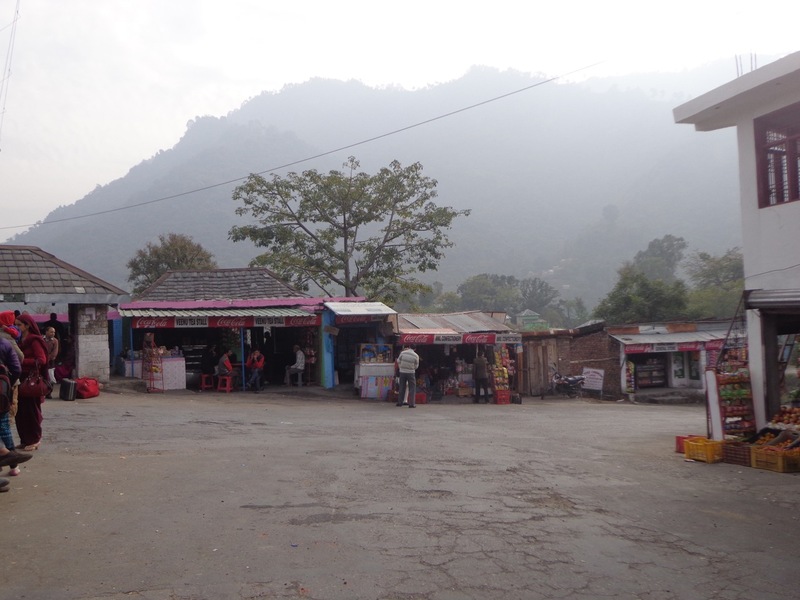 When I reached Dharamshala market, it was already well past 6:00 pm. I had unintentionally violated one of my principles – that I would not travel beyond 5:00 pm in the hills. I checked maps and found that reaching hotel (which was in McLeod Ganj) by walk would be a 2.5 km uphill battle through a dark road with a 14 kg load on my back. The gentler slop via NH 503 was about 10 kms. I took the easy (and the sensible) way out, paid 150 rupees to a taxi and landed at Hotel Tokyo House. The guy at Hotel Tokyo House offered me a better room in a better hotel called Backpackers Inn without any extra charge. My room in Backpackers Inn. It has a balcony, too. By the time I had settled myself and freshened up, it was 7:15 pm. Most shops had already shut down. 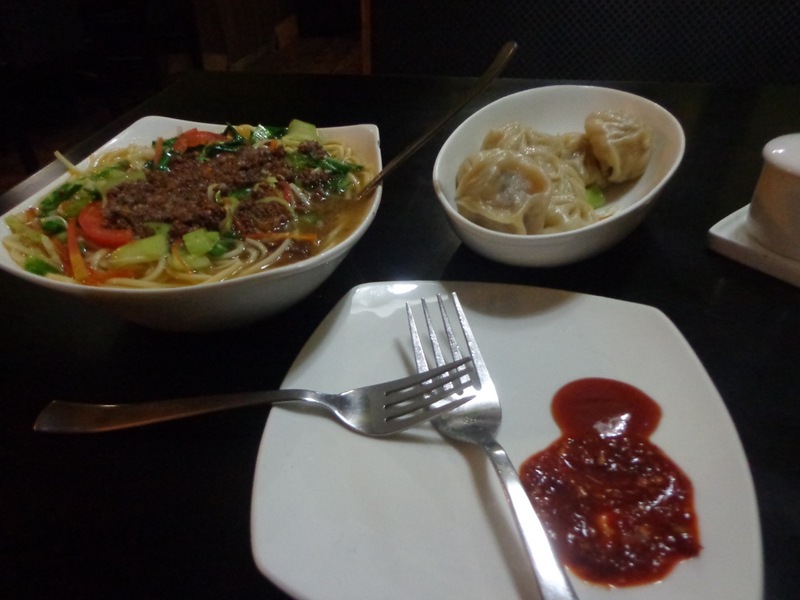 I strolled through the area and got into the first Tibetan restaurant that I encountered. Finally, I had some food that was right up my alley.